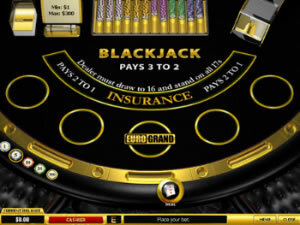 There is a lot to like about Euro Grand Casino, which is one of the better run and operated Playtech software powered casinos. 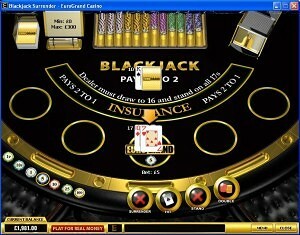 It is of course available to play via a fully downloadable platform or an instant play version, and if you love playing Blackjack then their selection of games is first class! Below are just some of their Blackjack card games which will be waiting for you if you decide to give them a try, and remember you can put these games through their paces via a free play mode and therefore test drive them all at no risk! Whilst the welcome bonus currently on offer at Euro Grand Casino may not seem that massive, unlike other online casinos they do not have pages of terms and conditions regarding their sign up bonus, and as such even though you can only claim 25% of your deposited amount upto a maximum claimable amount of 250.00 it is a very fair one to consider taking. Spend a few minutes checking out their website as that is where you will find the small set of rules regarding their welcome bonus and you will soon see for yourself just how fair this bonus offer really is.